Personal health and fitness has joined the digital revolution. Using Microsoft HealthVault, people interested in monitoring their health have an unprecedented opportunity to research their own data. 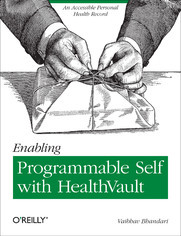 This concise book explains how HealthVault users can collect and analyze their data, and how application developers can help them with mobile or web-based applications. You&#8217;ll learn how to use HealthVault&#8217;s open API, flexibility, and connections with multiple health-care providers to develop health data applications, enable automatic updates from well-known fitness devices, and use programming libraries to create reports and investigate trends. So, What Should We Build? What About Android and iOS?